Search for the truth to reveal the impossible! There is more to our world than modern science would have us believe. Myths and legends abound of fantastic creatures and places that society passes off as fairy tales and children’s stories. You think otherwise and have dedicated your life to uncovering the truth. What you might find, however, is more than what you bargained for. Legends and Lies, designed by Diane Sauer and published by Shoot Again Games, is comprised of 62 cards. The cards are standard size and as durable as your higher quality playing cards. The illustrations on the cards by artists Brandie Fettig and Bess Goden do a good job of capturing each card’s narrative element which serves to further strengthen the game’s theme. Note included with the game, but necessary to play, is a pen or pencil and something to write on to keep track of players’ points. To set up the game, first shuffle the cards and deal each player 10 cards, face-down. Second, Place the rest of the cards, face-down, in the middle of the playing area. This is the draw deck and is referred to in the game as the “Unknown”. Third, draw the top-most card and place it face-up next to the draw deck. This creates the start of the discard pile, which is referred to in the game as the “Tabloids”. That’s it for game set up. The player who dealt the cards is the first player. There are five different card types in the game. They are summarized here. Players should pay attention to the cards because some of them have special effects that will impact game play once they are used. Expedition cards represent strange and otherworldly creatures that the players are hunting for. Expedition cards are worth points and will be played to the table during the game. Proof cards are like the Expedition cards, except they can only be played with a specific creature type. 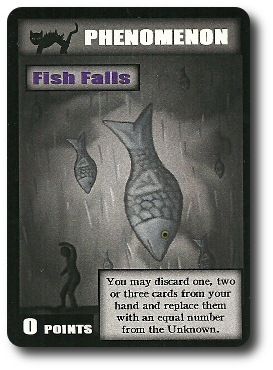 Thematically speaking, Proof cards represent pictures, artifacts, and other “totally legit” concrete evidence that the legendary creature exists. 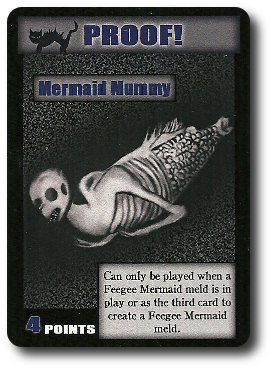 For example, the “Mermaid Mummy” Proof card. They are also worth points and will be played to the table during the game. Hoax cards represent evidence that proves another opponent’s claims of a legendary creature existing as falsified trash. Hoax cards are played in front of the owning player and are worth points. They also allow the player to discard any 1 card currently in play, including cards they own. Phenomenon cards represent the briefest of supernatural events that blow through our otherwise normal lives. The cards are played, resolved, and then discarded. Strange Occurrence cards represents supernatural events that no one witnesses, but their effects are visible. These cards are played, resolved, and kept for points by their owning player. Legends and Lies is played in hands and turns with no set number of turns per hand. On a player’s turn they will complete a small number of sequential steps. Each step is summarized here. Note: Proof, Hoax, Phenomenon and Strange Occurrence cards are all consider “Anomalies” and can be easily recognized by the black cat icon they all share on the upper left-hand corner of the card’s face. Only 1 Anomaly card can be played per turn by a player in addition to any Expedition cards they might play. Playing Anomaly cards is always optional. The player may either draw the top-most card from the “Unknown” draw deck or the top-most visible card from the “Tabloids” discard pile. Thematically speaking, the player is gathering evidence by either venturing into unknown territory or rooting through the trash that you find next to the grocery store checkout line. Wherever the card comes from, it’s immediately placed in the player’s hand. If this is the first time playing cards of a new creature type not yet visible on the table, the player must lay down 3 or more cards of a single creature type to create a meld (a set of identical cards). They can also play 1 Anomaly card to help create a meld of 3. 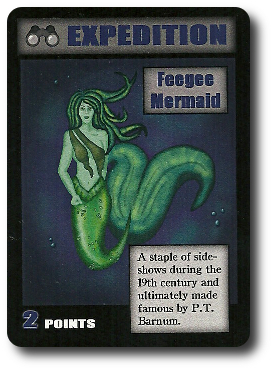 For example, the player could play 3 “Feegee Mermaid” Expedition cards or 2 “Feegee Mermaid” Expedition cards and 1 “Mermaid Mummy” Proof card. 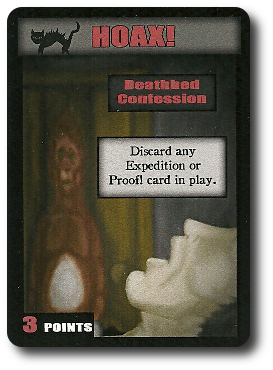 The player can add 1 or more Evidence cards to Expedition cards that have already been played BY ANY PLAYER. Creature types must always be played to similar creature types (you are just matching cards here), but wild cards can be played wherever the player likes. A player can only play 1 Anomaly card per turn. Cards played are always kept in front of the player, even if they use an opponent’s meld of creature cards. When the player is done playing as many cards as they like to the table, they MUST discard 1 card from their hand to the “Tabloids” discard pile. This ends the player’s turn. The next player in turn order sequence now goes. When a player discards their last card, the hand is almost over. All other players must now place 1 card into the “Tabloids” discard pile. Players do not take regular turns at this time. After every player has finished discarding 1 card, a few things now happen. The first player takes the “Tabloids” discard pile and organizes it by color. Each card in the “Tabloids” that matches the color of Expedition cards in play represents a sensational story. The rules give an example story titled “Bigfoot Fathered My Child!” which is both sensational and idiotic. But, hey, if the story sells, print it. Unfortunately, these sensational stories discredit the legit evidence players have found. Thematically speaking, the more you see a creature in the tabloids, the less the likelihood that anyone will take its existence seriously. Game play wise, for each card in the “Tabloids” 1 card from the largest meld (the most cards in front of a player) that has the same color is removed from the game. 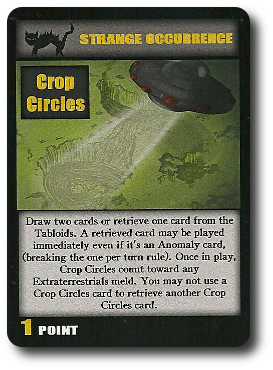 The card used in the “Tabloids” is also removed from the game. If two or more melds have the largest number of cards, 1 card is removed from each meld. It’s possible for one or more creatures types to be completely removed from the game. After all the “Tabloid” cards have been resolved, players add the points from the cards they played that are still on the table. The points are shown on the cards. The player then adds the points from the cards in their hand (the cards not played). Using these two numbers, the player determines their total points by subtracting the points in their hand from the points earned from played cards. Note that the final score could be a negative value. These values are recorded on a piece of paper and added to any points scored during previous hands. After cards are removed due to being discredited from sensational tabloid journalism and before players count their total points, they should determine if their efforts have resulted in the mother of all legends. 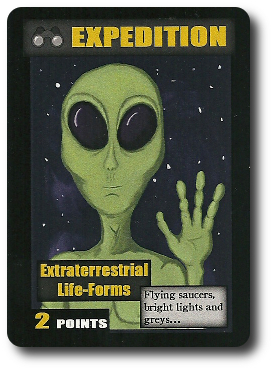 If a player has 10 or more points for the “Extraterrestrial Life-Forms” creature type AND they were the player to go out (end the hand), they score points as normal, but all other players score ZERO points. At the end of the hand and after adding scores to any previous scores, any player who has scored 100 or more points wins the game. If none of the players have scored at lease 100 points, the player with the current highest score becomes the dealer (and the first player for the next hand). Repeat the game set up steps as described above and play another hand. The game play and set up described above is for 2 or 3 players. If playing with 4-players, split the players into teams of 2. Players are dealt 8 cards instead of 10. Team members look at their cards and then pass 1 card to their partner, face-down. Team members cannot communicate to each what cards they want or do not want. When playing, players can either draw from the “Unknown” draw deck, the “Tabloids” discard pile, or pass 1 card to their partner (the partner also passes a card back). When the hand ends, if either team has a shared total of 15 points for the “Extraterrestrial Life-Forms” creature type AND they were the team to go out (end the hand), they score points as normal, but the players in the other team score ZERO points. Other than that, points are scored the same and the game concludes when one team has 150 or more points at the end of the hand. 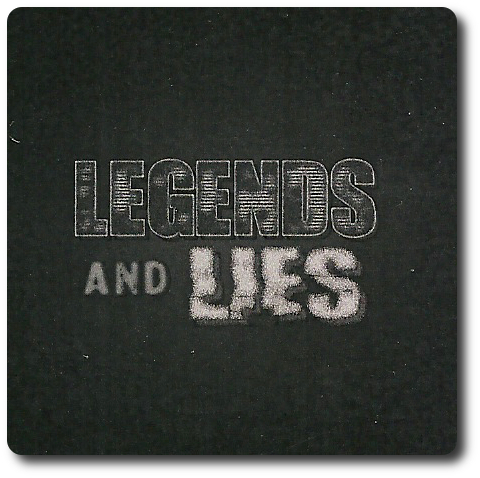 To learn more about Legends and Lies, visit the game’s web page. The Child Geeks had a wonderful time playing this game. Legends and Lies was easy to teach and they quickly understood how the game was played. The younger players tended to collect cards in their hand instead of playing them out. All the Child Geeks quickly learned that cards in the hand equal points lost and this practice of card hoarding quickly became passé. After several hands, they established a rhythm and an excellent balance. According to on Child Geek, “I like this game. I like what it’s about, it’s fun to play, and I love that I can play off other people’s cards.” Another Child Geek said, “The only thing I don’t like about this game is that it doesn’t have more monsters.” None of the Child Geeks liked the 4-player game variant that created teams. They preferred “everyone against everyone”. When all the games were over, the Child Geeks voted to approve Legends and Lies. My oldest Child Geek considers his move while his younger brother looks on, secretively…. The Parent Geeks also enjoyed the game, but not as much as the Child Geeks. The Parent Geeks immediately recognized Legends and Lies as a Rummy style game. This helped a great deal when teaching and learning how to play the game, but they felt like the game was a bit restrictive and too easy at times. According to one Parent Geek, “I’m enjoying this game, but I’ve played better Rummy games in the past. I think this is a good game, however, just not one that I think will be a favorite.” Another Parent Geek said, “I cannot say that the game doesn’t work and play well, but it just feels a bit too easy to me. I bet that’s because I know how to play Rummy, however.” That’s an excellent point and when a Parent Geek who had not played Rummy before played Legends and Lies, their response was enlightening. “I really like this game! I like how we have to find matches, play off each others cards, manage our cards and timing. Great game!” The Parent Geeks voted to approve Legends and Lies, finding it to be a good family game, a descent card game, and a good time in general. The Gamer Geeks, who are all too familiar with Rummy style games, quickly understood and mastered Legends and Lies. Overall, they found the game to be “meh”, which is neither good or bad. According to one Gamer Geek, “It’s fine, but just feels a bit soft. It’s missing something. When I play it, I feel like I want to do more than what the game allows me to do.” Another Gamer Geek said, “It’s a solid enough game, but not one that I would seek out. I’d play it with non-gamers, though, as the theme is interesting.” And finally one Gamer Geek said, “A good attempt at making a Rummy style game out of an interesting theme, but it’s not there yet. This game needs to be streamlined.” The Gamer Geeks’ final vote gave Legends and Lies a mixed level of approval. I think this is a fun Rummy style game, but I’m not a fan of the cards. I would have liked to have seen simple icons added to help players understand how the card is played. Truthfully, the game is not that difficult to begin with and the card text does a descent job of explaining what the card does. But some of the cards don’t do anything other than provide points when played and they have flavor text in the same boxed format as cards that have an action. For our first couple of games, this card layout method caused a bit of confusion and delay. Second, I wanted the game to be more. I wanted more creatures, more ways to disrupt or manipulate the table, and more ways to go about winning the game. All nitpicks, I assure you, and nothing that I would say are “game killers”. What I really liked was the “Tabloids” discard deck usage at the end of the game. This hurt players, badly, if we let cards slip into the “Tabloids” that we were collecting. It was very common to see players jump on cards in the “Tabloids” because it was part of a meld they were working on. A bit of a “tell” for the rest of the players, but since everyone works off each others points, it’s worth getting cards out of the discard pile. To a point. I really liked how I had to purposely create melds made of 1 or 2 fewer cards than the leader because I knew that cards in the “Tabloids” would whittle down the leader’s total points. That’s a lot of fun and just one more part of the game players had to consider. “Shooting the Moon”, so to speak, by obtaining all the alien cards is just downright impossible if you are playing with others who watch the table. It’s a great goal, but not one you can easily do. Still, I tried it and always came up short. Worth going for, however, as there is nothing penalizing you if you fail. If you do it right, you can use the alien cards as a decoy while you collect other cards. Based on our observations and collected comments, Legends and Lies is a great game for the Child Geeks, non-gamers, and casual game players. For the gaming elitists, it boils down to personal taste and liking Rummy style games to begin with. I personally think Legends and Lies is a pretty good game – not great – but pretty good. Good enough that I enjoy playing it with family and friends, despite always feeling something is just a bit “off”. But nothing is perfect and it’s the game’s imperfections – which are slight – that players will quickly overlook and forget as they compete for legendary points while finding mythical creatures. If you enjoy Rummy style card games, cryptozoology, and the search for the truth, then do sit down for a game or two of Legends and Lies. You might be surprised what you find. 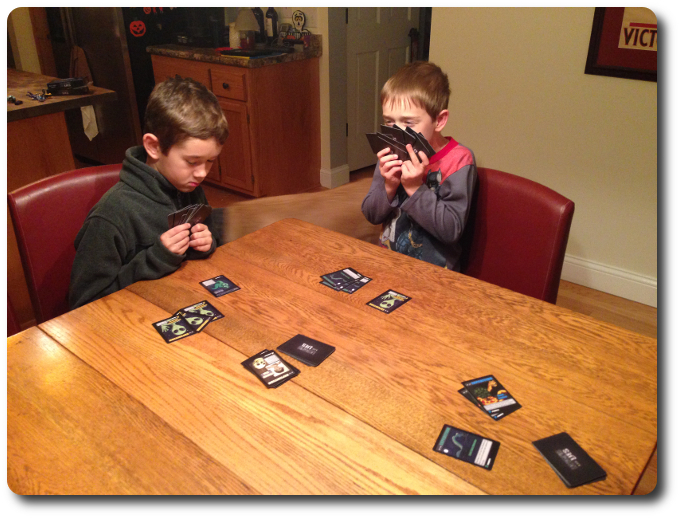 Tagged Card Games, Child Geek Approved, Cooperative Games, Parent Geek Approved, Science Fiction Games. Bookmark the permalink. The alien shut-out is not as impossible as you make it sound. While certainly not even remotely common I have seen a number of shut-out hands over the course of all my playing. Thanks for reading the review and leaving a comment, Nick. Consider yourself lucky. While I have successfully collected enough points for the alien shut-out a few times, it remains a difficult task to complete when playing with individuals who are watching the table like hawks. What I need to do is stop playing with really good players. Or, better yet, start playing with individuals who have really bad eyesight.